Fillets all fishes of a stack. The process will be aborted, if you close the inventory, e.g. by pressing ESC or start moving. 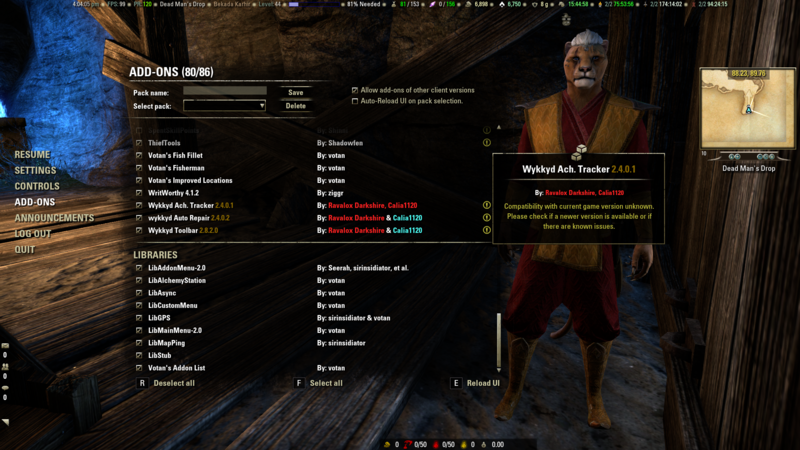 To see any stats, you need to fillet a fish with this addon first. The fishes and perfect roe get counted. If you bypass this addon, by simply "Use" a fish, the stat do not get updated. Filetiert alle Fische von einem Stack. Der Prozess wird unterbrochen, wenn das Inventar geschlossen wird. Zum Beispiel durch ESC oder durch bewegen. Um die Statistik zu sehen, muss ein Fisch mit diesem Addon filetiert werden. Die Fische und der Rogen werden gezählt. Wenn dieses Addon durch einfaches "Benutzen" umgangen wird, wird die Statistik nicht aktualisiert. "Use item" itself requires a free slot, even if the resulting fish would stack. 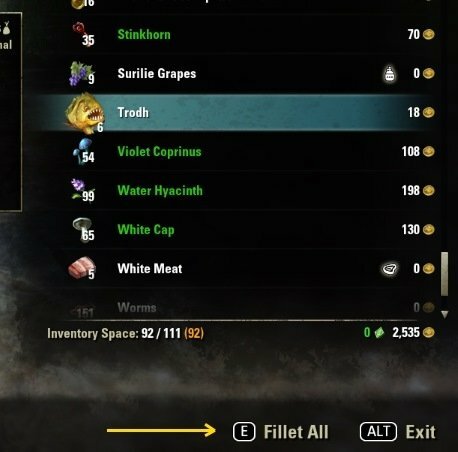 If you start with one free slot and don't have a fish fillet already, the process stops after one fish with "Inventory is full". Valadez and ColonelCorn for helping me to find and fix it. - Update to LAM rev 26. - French translation. Thanks to @Frackou. - Update to LAM rev 25. - Update to LibCustomMenu rev 4.2. - Update to LAM2 rev21. - Update to LibCustomMenu r4.1. * For "Fillet All Stacks" you have to select a fish stack and go the "Actions". Or enable "Fillet All Stacks" as default. - Fixed "Fillet All Stacks" was always active. - Aborting corrected for update 7: One fish faster. - New slash command (/roestats) to show stats without having fishes left. Suggested by Wandamey. * As a side-effect stats shown at perfect roe, too. - Stats have 2 decimals, now. - ESO 2.1 (update 7) ready: They changed the time between getting fish and cooldown. - code cleanup, because the source of "insecure code" warnings is known, now. - Do not show option in trade window. - Support for "Perfect Roe"
- Support for non-standard launcher: Check if UseItem is a protected function instead of assuming it. - "Use item" (filleting) itself requires a free slot, even if the resulting fish would stack. Therefore the process stops if the inventory is full. - Abort fillet process if closing inventory, e.g. by ESC or start moving. yes. Any other activity, like using another item, will cause trouble. I'm not sure if I am seeing the same thing that Shocker74 posted about but I am experiencing a problem with the Fish Fillet Addon. I've been using it for months but after the Murkmire update it does not appear to be working anymore for me. I have the Addon turned on under Addons but I no longer see the Fillet Stack option when I right click on a stack of fish in my inventory. I tried uninstalling it (removed saved variables) via Minion and reinstalled but still the same issue. I've posted a couple pics of my Addons Library list and the behavior when right clicking a stack of fish in my inventory. Hope I'm just missing something. Thanks! So now wondering if this update to LibCustomMenu is what brought the Fish Fillet functionality back. Either way it now appears to be working as expected for me. I am experiencing the exact same thing but I see no contextual menu for fillet all stacks. Stopped doing its job after the Murkmire patch hit. What do you mean with stopped doing its job? Of course you have to enable addons (=libraries) of other client versions. okay installed http://www.esoui.com/downloads/info7-LibAddonMenu.html and now they look like this. Also, I updated all addons. Then ran into the libaddon 2.0 issue. Last edited by BigM : 08/13/18 at 02:14 PM. First, I had to suspend my ESO Plus subscription, so an item cannot be stored in the Crafting Bag, only retrieved from it. Yesterday, one of my character's fished in Coldharbour "azure plasm" sites -- all of them are "foul water" -- and eventually acquired 46 Slaughterfish and 44 Trodh. So I used the context menu "Fillet Fish" option to begin filetting the fish and continue until all were filetted. The add-on paused temporarily a few times in the process. However it did not display any message that it had found a Perfect Roe. Afterward, not even one Perfect Roe was added to the materials stored in the character's Bags. Only the 90 filetted fish were present. Certainly, I suppose it is possible for the Pseudorandom Number Generator to output 90 consecutive negative outcomes, but the likelihood of it doing that is rather small. In my previous experience, Fish Fillet finds one Perfect Roe for each 20 - 30 fish that it fillets. What I want to know is whether Fish Fillet encountered a problem because it found one or more Perfect Roe, but could not store them in the Crafting Bag, and/or could not store them in the character's Bags instead. Thank-you for your time and attention to this inquiry. Fish Fillet is among the essential add-ons for playing TESO. This addon triggers "UseItem" only. It has nothing to do how and where resulting items get stored, nor does it find Perfect Roe or increase it's drop rate. As the drop rate is around 1% using less than 100 you may not get anything. If i only ON the first option of the addon, then it only fillet ONE stack no matter the quantity of a sort of fish. If i want to fillet all stack without interruption of all sorts of fish i have to ON the two options. If i dont do this, then the next character of mine with a stack of fish different from the the other character will not be filleted. It must be another add-on because I turned off Fish Fillet and when I go to fillet a fish it still bugs out on me, preventing me from filleting anymore fish. Edit: Bug still present with all add-ons disabled so I'm lost as to why it's only affecting certain people. @bottleofsyrup and @Amaljia: Are you ESO+? Updating the update.. I was wrong. It stopped working on the second character I was testing. What I did is only take out 20 fish to fillet. First character = no problem. Second one filleted 10 before it hang. However, when checking in my bag I had 11 (locked) raw fish, yet loot tracked showed me another 10 skinned. Perhaps that's where the issue is? Last edited by Anceane : 06/19/18 at 01:48 PM.